Uli Jon Roth has partnered with the Dean Guitars USA custom shop to offer limited edition production versions of his iconic Sky guitar. Available in six and seven string versions, it’ll be unveiled at NAMM on January 14. I can’t wait to check this one out, and I’ll be sure to post my thoughts from NAMM. The long-awaited first official Uli Jon Roth signature SKY GUITAR will finally be unveiled at the Winter NAMM show in Anaheim, California on January 14th, 2010. There will be two different models on display, a six-string and a seven-string version. This limited edition will be super-custom built 100% to Uli’s specifications by the custom shop of Dean Guitars USA. Each guitar will be personally named and approved by Uli Jon Roth. Sky Guitars were the first electric guitars with a truly extended upper range and lots of extra frets. Uli originally designed the Sky Guitar in 1982 and the development phase went through 5 proto-types, the culmination of which was “Mighty Wing” – his legendary seven-string guitar, which features an un-precedented six octave range. 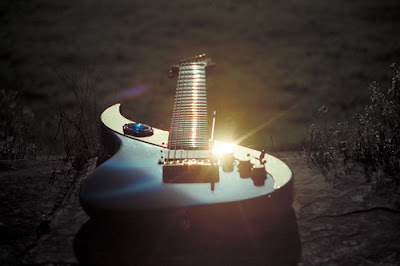 From the beginning, Sky Guitars embodied the very spirit of cutting-edge innovation. These new models will honor this tradition and will incorporate several new features. Over the past few years Uli has been approached by numerous guitar manufacturers who offered to build Sky Guitars and guitarists from all over the world are constantly asking where they might buy them. Going back as far as the Eighties, there have been companies who sold Sky Guitars, either without Uli’s knowledge or without his consent. Many private individuals have also had copies built for themselves, because of the unique and appealing design and the features. But these were all just copied from photographs and no one had access to the precise dimensions of the originals; hence most of those copies resulted in poor imitations, which didn’t stand a chance to live up to the extremely high standard of the handful of originals, which had been hand crafted by the brilliant British master luthier Andreas Demetriou back in the Eighties. To celebrate the release Uli will play the new Sky Guitars for the first time in public at a special performance at the Anaheim Grove Theater during the NAMM show on January 15th. One of the first stories I wrote on I Heart Guitar was about the relaunch of A/DA. Well now the big day has come, and the company has shipped the first 100 new flangers. The second batch will go out next week, and production has also begun on the reissue Final Phase phaser pedal, which will be shipping soon. Bill from A/DA tells me: “To faithfully reproduce the original A/DA Flangers sound, we needed to find NOS BBD chips, which was quite a challenge. This challenge delayed our original intended ship date.” I think it’s awesome that rather than rush out the pedals to meet the obvious demand, A/DA has waited to get the proper parts and do it right. Here’s A/DA’s David Tarnowski signing off on the first shipment of flangers at 2AM. Also, check out the relaunched A/DA website at adaamps.com. Happy new year, everyone! Hope you all have a great year full of lots of shredding, headbanging, living, loving, laughing, eating, drinking, and all that fun stuff. Got some cool things coming up on the site this year, starting with coverage from NAMM in a few weeks. If there’s a piece of gear you’d like me to cover, just email me and I’ll go to their booth, take some photos, get some info and write a post for you (and feel free to link to it on any forums you visit). Also this year I’m going to become more active on YouTube, with more video reviews and hopefully artist interviews. A few people are encouraging me to do face-to-face artist interviews on camera where both the artist and me have guitars in hand, which could be very cool but hard to organise, but I’ll do my best. There will also be more giveaways this year, and some cool I Heart Guitar merch. Anyway, hope you have a good one, and here’s to another year of rockin’. Guitarists are forever locked in an epic battle between functionality and flexibility. We dig effects, but we prefer if they’re in the form of little boxes with easy-to-use controls. We love combining different sounds to create something new, but loathe doing the little tapdance required to turn them all on (or off) at the right time. Floor-based multi effect units are great, but most are designed to be the entire source of your sound, so you’re stuck, for better or worse, with whatever amp models are built in. 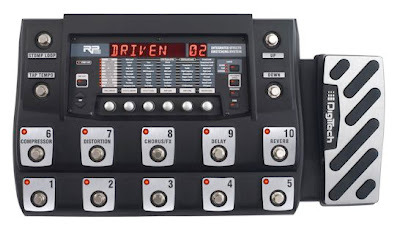 The new Digitech RP1000 takes a lot of the features that have made the RP series so popular, and integrates with your amp by allowing you to place the unit’s effects either before or after your preamp – kinda like having a pile of stompboxes on the floor and an effects rack plugged into the amp’s effects loop. There’s a roundabout way to do this with the Boss GT-8 , which I used on stage for a while, but it was an unintended side effect of the design, and required all sorts of special cables and hum eliminators to work. The RP1000 is specifically designed to do it, so that’s one big advantage right there. The RP1000 has over 160 internal stompboxes, effects, amps and cabinets, as well as an additional stompbox loop. Say you have a particular pedal you just can’t live without, but you want to use the RP1000 too: just place that pedal in the loop and you can turn it on and off within your patches. Neat. Oh and as an added bonus, you get Cubase LE4 recording software too! Features include 14 very chunky, confidence-giving metal switches that control program changes, effects on/off, stompbox loop in/out, bank up/down, and the built-in 20-second looper (on the day I received the RP1000 to review, I’d been listening to a lot of David Torn , so I was in loop heaven). There are two different control modes: Preset and Pedalboard. In Preset mode you can switch up to 10 different presets on a single bank, while in Pedalboard mode there are 5 presets and 5 effect on/off switches. Think of Pedalboard mode as 5 different amp and pedal rigs, with the ability to turn on or off any pedal for that setup. Additionally, if you want to use your amp’s natural sound as the basis for your tone (instead of the RP1000’s amp models), there’s an internal Amp/Cabinet Bypass switch which removes the RP1000’s internal amplifiers and cabinet effects from the signal chain, leaving only stompboxes and effects. One particular benefit of the RP1000 compared to most other multi effect floor units is that it includes dual stereo XLR outputs for going straight into a mixing desk. I plugged it into my DigiDesign Mbox 2 for some very accurate and clear reproduction of the sounds, and was particularly impressed by the edgy clean sounds and the Lexicon-licensed reverb effects. I was able to compare some of the models to examples of the actual gear I had laying around, including the Marshall JCM2000, and the MXR Phase 90, and while the modelled sounds aren’t 100% spot on (with the exception of the extremely accurate DOD FX25 envelope filter, another unit I have kicking around the house), they sound close enough to give you most of the same vibe. I found that the stomp box models worked especially well with my amp instead of the inbuilt amp models. My favourites were the trigger flanger (very Frank Zappa); the DOD FX13 Gonkulator Modulator, which is great for Nine Inch Nails-style processed guitar sounds, and the harmonizer, which includes major and minor scales in all keys, as well as settings for some of the modes, for those who aren’t totally into their music theory. I especially liked the harmonic minor scale setting for instant Yngwie. You can set most effects to be either pre or post amp (or amp model), which is a huge benefit for those who need their phaser to sound spacey (after the amp) in one song, and syrupy (before the amp) in another, for example. I found that the Carvin Legacy model didn’t sound like the actual amp, but if you’re after Vai tone you can get quite close by combining the JCM900 and Tube Screamer models with some digital delay and reverb. On the other hand, the acoustic guitar models sound surprisingly accurate and are very useful, and the various Mesa Boogie models are also pretty close to the real thing. I slung my Ibanez UV777BK seven string with DiMarzio Blaze pickups and dialled in a Petrucci-like Awake-era tone, kicking in the wah wah to get in the ‘Caught In A Web’ zone. Cool! My only beef with the RP1000 is that there is no way to switch amp channels, which slightly limits the practicality of the unit – you may have to get used to having all your settings and effects stored on individual buttons for your clean, rhythm and lead sounds, but needing to step on a separate amp channel switch as well. One way around this would be to use varying levels of distortion pedal on top of your clean sound. Another would be to set up your amp with your medium-level distortion sound, then create a patch that drops out some frequencies and reduces the input (similar to lowering your guitar’s volume control) for a clean sound, and adding a boost or overdrive to kick it up to high gain territory. This is what Paul Gilbert does with a bunch of pedals and a single-channel amp, so an argument could be made that the RP1000 makes this method much easier. This 3-pickup Les Paul Custom with Bigsby was released in 2008 and quickly zoomed to the top of my Want List. Three humbuckers. Gold Bigsby. Specially designed pickup selector switch with extra settings to incorporate the middle pickup. And did I mention the gold Bigsby? Oh well, let me mention it again. Gold Bigsby. Ok, enough of this japery. Here’s the press release about the new Jimmy Page model. I’ll meet you again after the press release for my commentary. Every musician knows that late ’50s Sunburst Les Paul Standards are hard enough to come by as it is. Obtaining a pristine and exemplary ‘59 ‘Burst and modifying it for heightened performance and vastly expanded tonal options? Unheard of… unless, of course, you’re Jimmy Page. That’s exactly what the legendary Led Zeppelin guitarist, perhaps the world’s most iconic Les Paul player, did with his own ‘59 Les Paul Standard, and now, thanks to the extreme efforts of Gibson’s Custom Shop and the intimate cooperation of Jimmy Page himself–the artist’s hallowed “Number Two” Les Paul is available to mere mortals, in the form of the Custom Shop Jimmy Page “Number Two” Les Paul. This was several years after having acquired his other legendary Les Paul–”Number One”, a ‘59 ‘Burst with shaved-down neck profile and no serial number–from Joe Walsh. “Number Two” was essentially all original when he acquired it. Jimmy did have some modifications done to the neck shape so that it would more nearly match the feel of his “Number One”. The neck is certainly slim but not to such extremes as the now-ultra-slim neck on “Number One”. It had a strong, beautiful sunburst finish with a red element that had faded to a dusky amber-brown, along with a clear serial number dating it to 1959. Page played this Les Paul frequently through his days with Led Zeppelin, and in the early ’80s decided to make it an even more versatile instrument. The result comprised a push/pull pot on each of the guitar’s four standard controls, plus two push-button switches hidden beneath the pickguard, all mounted on a ‘59 Les Paul Standard that is otherwise a superb example of the breed, both in tone and playability. Got that? Cool, huh? Now, these guitars certainly aren’t cheap – the aged/signed version is $25,882; the aged version is $15,294 and the VOS version is $11,176. Be that as it may, I think it’s really cool that Gibson and Page are teaming up to do these reproductions of his iconic axes, and that they’re doing it right. Would I pay that much for one? Well, no, because once upon a time I didn’t even MAKE $25,882 in a year. But it would have been all too easy to just throw the Page custom wiring into an existing model and be done with it. At least Gibson’s going to the effort to get this stuff exact – even though I might have to trudge down to my local Cash 4 Kidneys to afford one. What do you think? Can you put the cost aside and geek out over this new axe, or is that hefty price tag just too much of a hurdle? First off, the Line 6 Pocket Pod is such obvious genius that I can’t believe it wasn’t the very first thing the company invented. You know that episode of the Simpsons where Homer had financial problems and he dreamed he invented something that changed the world (and fitted in the palm of your hand) but he was woken up before he could see what it was? Well I’m pretty sure it was the Pocket Pod. What you get here is 100% of the famous Line 6 digital modelling technology in about 1/8 of the size. The Pocket Pod is the same familiar kidney bean shape as the regular desktop Pod, but it’s about the size and thickness of a Bubble-O-Bill ice cream. For a small handful of cash you get 32 classic and modern amp models, along with 16 cab models and over 300 custom presets by guitarists from Thursday, Ash, As I Lay Dying, Sparta, 311, P.O.D, Razorlight, Hawthorne Heights, Killswitch Engage, Maroon 5 and Guns N’ Roses. The list of amp models – ready for this? – is ’64 Fender Deluxe Reverb, ’59 Fender Bassman, ’68 Marshall Plexi 100 watt, Marshall JTM-45 meets Budda Twinmaster, ’60 Tweed Fender Champ, Budda Twinmaster head, ’65 Blackface Fender Twin Reverb, ’60 Vox AC 15, ’60 Vox AC 30 non-Top Boost, ’85 Mesa/Boogie Mark IIc+ Clean Channel, ’85 Mesa/Boogie Mark IIc+ Drive Channel, Dumble Overdrive Special Clean Channel, ’95 Mesa/Boogie Dual Rectifier Head, ’89 Soldano SLO Super Lead Overdrive, Dumble Overdrive Special Drive Channel, 1987 Roland JC-120 Jazz Chorus and Line 6 Insane. Available speaker cabinet models are 1960 Fender Tweed Champ, 1952 Fender Tweed Deluxe Reverb, 1960 Vox AC-15, 1964 Fender Deluxe Reverb, 1965 Fender Blackface Twin Reverb, 1967 Vox AC-30, 1995 Matchless Chieftain, 1959 Fender Bassman, 1996 Marshall with Vintage 30s, 1978 Marshall with stock 70s, 1968 Marshall Basketweave with Greenbacks, Line 6 4×12, Line 6 1×12, Line 6 2×12 and Line 6 4×10. There are 16 effects: Compressor, Tremolo, Chorus 1, Chorus 2, Flanger 1, Flanger 2, Rotary Speaker, Delay, Delay/Compressor, Delay/Tremolo, Delay/Chorus 1, Delay/Chorus 2, Delay/Flanger 1, Delay/Flanger 2, Delay/Swell, Reverb. The sounds are great whether used for practice or recording. For my money, some of Line 6’s best work is in their emulations of naturally overdriven Marshalls and highly distorted metal amps. I was able to create some quite authentic classic rock girth and grit with the former (rocking the 100 watt Plexi model with my PAF-alike-loaded Ibanez Talman), and some Megadeth ‘United Abominations ’ style tones with the latter (via the Insane model and my trusty Ibanez RG550 with Seymour Duncan Parallel Axis Trembucker). I also had a lot of fun calling up a somewhat ‘For Unlawful Carnal Knowledge ‘-era Eddie Van Halen sound using the Soldano model and Delay/Chorus 1 – headphones really brought this one to life especially during my half-assed rendition of whatever I could remember of Eddie’s live ‘316’ solo from the ‘Live: Right Here Right Now’ CD/DVD. Dragging out my old Strat copy I was able to pull convincing faux John Mayer sounds out of the Dumble Special drive channel-inspired model, and I went all SRV with the ’64 Fender Deluxe Reverb-based model and some reverb. There’s so much tonal variety on tap here that you can play around with sounds for hours, and that’s before you start tinkering with them via computer with the included Vyzex software, where the on-screen control layout takes the fiddly work out of setting your sounds. Editing sounds using the Pocket Pod itself can be a little tricky, but since this device isn’t exactly configured for on-the-fly live use, you wouldn’t really expect a huge assembly of up-front editing features on the surface. The casing is probably a little too light to use live regularly if you’re in an energetic band, but I could definitely see myself throwing one of these puppies into my guitar case to use as a backup if my amp ever packs it in mid-gig. It would also be a very handy teaching tool – it never hurts to have an easily accessible library of classic guitar tones to dial in when helping a student nail their favourite song. Every guitarist needs one of these bad boys in their parts box, guitar case, gig bag, or on their desktop. It’s an invaluable backup as well as a fantastic tone generator in its own right. I only had the Pocket Pod on loan from the distributor for a few days but I would definitely like to buy one. In fact, every time I sit on the couch jamming unplugged on one of my electric guitars I can’t help but think of that baby Pod and wonder where it is now. This is an expanded version of a review that originally ran in Mixdown magazine. CLICK HERE to buy the Pocket POD from Musician’s Friend. Hi! I’m just testing the BlogPress app so I can do all sorts of live bloggage from NAMM in a few weeks. If there’s a product you’d like me to investigate for you at NAMM, let me know at iheartguitarblog@gmail.com and I’ll write a post about it from right there at the booth. Everyone loves personalised guitar picks (I have some killer custom picks from Grover Allman, which you’ll be able to buy in the new year when I set up a merch store). But if it’s Christmas morning you obviously don’t have time to get the fine folks at Grover Allman to whip up a batch of picks and send them off to you, so what do you do? 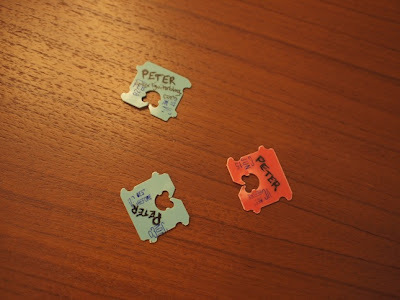 Here’s what: rummage around in the breadbox to look for bread tags (or ‘Toast Tickets’ as they’re called in my house). You’re bound to find at least a couple that had somehow dropped off their associated bread baggie and escaped your view for the last six months or so. Then you just need a magic marker (or a Dymo tape labeller if your guitarist buddy prefers the textured vibe) and a steady hand. Christmas saved! You’re welcome. Secretly, every guitarist really wants to play lap steel. It goes back to seeing David Gilmour playing a lap steel in the Delicate Sound of Thunder video. Real lap steel guitars can be expensive, but your guitarist buddy can instantly convert their guitar into a third-rate Weissenborn ripoff and themselves into the next Ben Harper when you give them this handy home lap steel kit. Simply wedge an Ikea pencil (they’re free!!!) 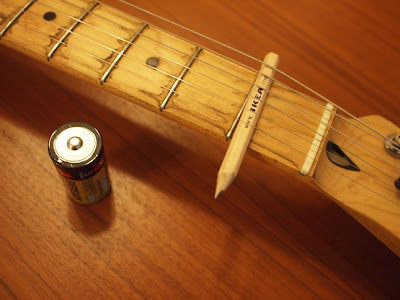 under the strings down by the nut, and use a C battery as a tone bar. They’ll be screechin’ the blues in no time, especially if the battery leaks. Cigar box guitars are a very popular DIY project – just look at the hundreds on Etsy – but what if you don’t smoke? Or what if you have your majestic stogies smuggled one at a time by means you’d rather not think about? Well, not everyone smokes but everyone has a nose. Just stretch some rubber bands over an empty tissue box. 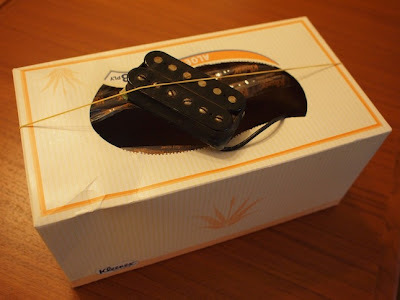 Don’t even worry about constructing a neck for your tissue box guitar – it’s a lot of effort and the string tension would probably crush it within microseconds anyway. Get creative with your tissue box guitar – cover it with sequins, glitter and stickers for that stage-ready vibe, or leave it unfinished as I’ve done. Tell them it’s your tribute to the Washburn N4 . Quick, go dig around in the closet. You’re bound to find a tie somewhere – maybe even one that you got as a gift last year. 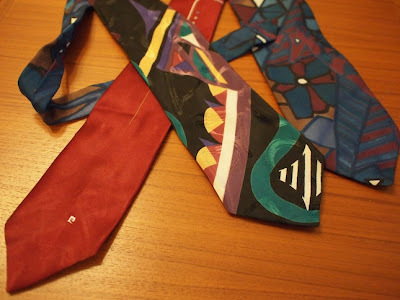 Or if you’re like me, about 10 years ago your former next-door neighbour gave you a bunch of his old ties from the 80s, many of them outrageously kitsch. Just gouge a notch in either end and you have an instant guitar strap. It’s so easy I don’t know why I never thought of it before. This eggnog’s good stuff. Merry Christmas from I Heart Guitar!